Notes: This is the first novel from my online writer pal Cindy Pon. The book just came out officially a couple of days ago, and I received my copy in the mail today. From what I can tell without reading the book as of yet, it's teen fantasy fiction with an Asian background (more specifically probably Chinese since Cindy's from Taiwan). I've been looking forward to this one for a good while now. I'm sure I'll enjoy it, and I'm looking forward to future works from Cindy. Also, this one breaks my fast from fantasy fiction. Yep, it's the first fantasy book I've read this year! Mini review: A true gem among modern fantasy and young adult novels. I'm proud to know the author and to have read and own a copy of the book. If you're familiar with the adventure fantasy genres and think there's nothing new under the sun, think again. You'll find plenty here that will seem as fresh and exotic as that first copy of "The Hobbit" you read all those years ago. For the first time in a long time, I experienced lands and creatures unknown to me, which is a lot more than I can say about most fantasy fiction I read nowadays. And the climax is somewhat unexpected, especially in a field until recently dominated by mostly male writers. I believe it took a strong female writer to come up with this ending, as few male fantasy writers would likely approach it from the angle that Cindy Pon did (Neil Gaiman notwithstanding, but Neil is ... hmm, something special and a god among writers himself). Hopefully without giving anything away, I'll say this ... love, true love, can be a powerful weapon. And for those of you who are fans of many of the modern fantasy stories for young adults (ie. Harry Potter, Eragon and the like) you'll find much here to enjoy. The writing is simple and clear enough for a young audience, though there are adult matters touched upon. An excellent for novel for a writer. And to stick with an old cliche, because it's true, I await more from this author with anticipation, especially since she left an opening for a sequel. Oh, one more thing; you'll learn a lot in this book about true Chinese food dishes (not the stuff in the U.S. that's served up as Chinese food, I mean real Chinese food). 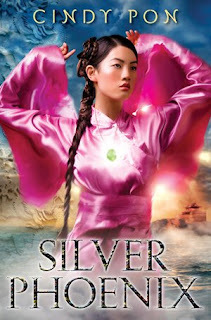 Yep, my online buddy writer Cindy Pon finally has her first novel, Silver Phoenix, hitting bookstores today. Yep, today! Check out the cover at right. Fantastic, isn't it? And I've read the blurb on the back. If the cover and the blurb aren't enough to get you reading the book, I don't know what will. My copy of the novel is in the mail, having shipped from Amazon on Saturday. And if you'd like a free, signed copy of Silver Phoenix, and other goodies to boot, check out Cindy's contest. Or go online and order the booker here or here or here. Notes: Jack Kilborn is actually a pseudonym for mystery novelist J.A. Konrath. 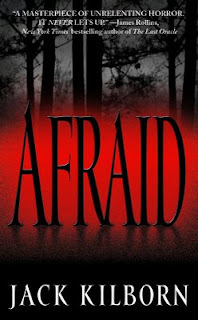 I've read one of Joe's novels and some of his short stories, and find them pretty good, so I'm interested to read his new novel "Afraid," his debut as a horror novelist (though his Jack Daniels mystery books have a fair share of horror). Mini review: Quite the appropriate title. This is a disturbing one, especially at first when the reader isn't quite aware of what the bad guys are. Fear of the unknown spurs this novel along well for a good while. Then when you do realize what the good guys are up against, you don't feel much better about the situation. This book packs a whallop, big time. No mamby bamby Stephen King small-town nicey monsters here. This is hard-hitting, death and torture. The weak of heart need not read this one, because it's that strong in places. The book's not completely dripping with gore. No, it's not out-and-out slaughter punk. There are stories to be found here, personal stories for the characters. But there's plenty that will keep you up at night wondering if you should check out the closet or look out a window to see what that sound was. And then you realize, it doesn't really matter if you check or not. Because it wouldn't do you any good. Extreme horror fans will love this novel. If you're one of those readers who likes your horror on the lighter side (ie. King and Koontz and the like), then this one won't be for you. Notes: Yep, I've still got a few Ed McBain novels to get through. Thought I'd take a break from my recent reading of literary classics and switch to some good ole crime fiction, at least for a bit. I'm hyped about this particular novel because it features the Deaf Man, a serial villain who has appeared in several of the 87th Precinct novels. 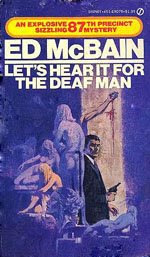 This is the first of McBain's books I've read that features the Deaf Man. Published in 1973. Notes: Another fun, quick read from McBain. The Deaf Man was interesting as a serial villain for the cops of the 87th, but I'm not sure I'd call him a genius. He thinks of himself that way, and the cops seem to view him that way to some extent, but I'm not sure it takes genius-level intelligence to give the cops a bunch of obscure clues that don't make a lot of sense. It might make sense to the Deaf Man, but his type of riddles are a bit of a stretch. Basically, no one would really be able to figure them out. Notes: This classic novel by the famed science fiction author is something I should have read years ago, but I didn't. So, now I'm getting to it. Mini review: A truly fantastic novel. Likely the best I've read so far this year. Every reader, even those who aren't drawn to the speculative, should peruse these pages. It's a classic. Fans of Stephen King will especially love this. Despite the fact it was published at least 15 years before King hit the scene, this seems very much like a possible early work of his. 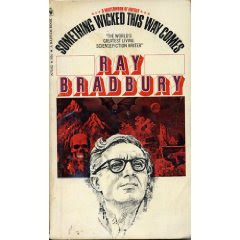 If King wasn't inspired by Ray Bradbury, I'll bite a bird. This story is practically dripping with Kingeese. There's a small town, two young boys-almost-teens, a creepy carnival that comes to town ... so much that sounds like it could be an influence on several of King's novels. You must read this, especially fathers and sons. Julius, over at his Chapter Desu! blog, has had some very kind words to say about my story "The Way the Sunlight Lies Upon Her Hair" found here at Every Day Fiction. "I got really inspired by one of the submissions there. It was under a thousand words. It was simple, straightforward and delivered what it wanted. It infiltrated my mind and set me thinking about it hours after finishing the story. I recommend anyone and everyone to take a look. It’s under a thousand words. Bite-size. So do check it out: The Way The Sunlight Lies Upon Her Hair by Ty Johnston. P.S: Don’t get fooled by the title. It’s not what you think it is." I believe those are some of the most flattering remarks I've ever heard from a reader. Thanks, Julius! And keep working on that novel! You'll get there. My story "The Way the Sunlight Lies Upon Her Hair" is up at Every Day Fiction. Notes: A secretive figure. Action and adventure. The French Revolution. What else could a reader ask for? Oh, maybe that it was written by Dumas. But you can't have everything. Mini review: Not a bad little story. Kind of quirky in that it's almost a side-story to the actual tale, with the protagonist here having her own little adventure on the side of the main hero's story. The writing here isn't the most exciting, but it's far from downright boring. Glad I read it, but still think Dumas could have done a better tale. Of course his version of the story would have been 800 pages longer and included a hundred side stories and a hundred little extra characters, but that's Dumas. Got some great news in my e-mail today. 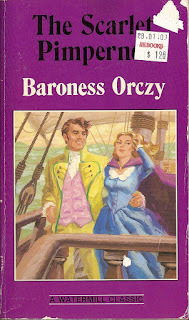 One of my all-time favorite fantasy books, Ariel, is going to be reprinted and is scheduled to come out August 26, 2009. Wait! The news gets better! After 26 years, there's a sequel to the book! Yep, Elegy Beach is scheduled to be released November 3, 2009. And the author, Steven R. Boyett, is at work writing another book. Which also has me excited. Besides Ariel, Mr. Boyett has written some short stories I like, including one of my favorite zombie stories, "Like Pavlov's Dog." So I'm looking forward to any new material from him. To give a little hint of what can be found in Ariel, it's a sort of post-apocalyptic story set in the near-future. The world has shifted. Electricity no longer works. Guns no longer work. And fantasy creatures, like unicorns and ogres and the like, are coming out of the woodwork. What to do? Grab your sword and crossbow! Lately I've avoided reading and writing speculative fiction. This has been intentional on my part. I've been reading more literary-type works, and I've several ahead of me. My to-be-read pile has very little speculative fiction in it at the moment. The reason for all this is because I've been working on a sort of mainstream/literary novel that does not have any speculative elements to it. I'm writing this novel for personal reasons, and I am enjoying doing so. However, all that being said, I've just spent the better part of the last hour perusing my usual hangouts online ... mostly speculative fiction forums and blogs and the like. And I'm kind of missing it. I've got friends and peers with novels and anthologies coming out. But I sort of feel left out. Not of their success. No, that's their doing. And congrats to all of them. But I sort of feel like I'm being left behind in the speculative fiction world. What to do? I don't know. I don't like breaking away from a novel when I'm in the middle of it, and it's not like I have any great ideas at the moment for any sci-fi/horror or fantasy short stories. I guess I'll just keep plugging along. Eventually I'll finish the current novel and my current readings. Eventually I'll get back to worlds beyond those I know.